As early as the 1940s, when she was appointed an official war artist, Molly Lamb Bobak was drawn to humanity, and depicted groups of women on drill, in the mess hall or at leisure. Afterwards, she continued to be fascinated with the dynamic rhythm of crowds in motion, painting bathers on the beach, pedestrians on busy streets and, in this evocative work, a group of skaters. Brian Foss writes that "For Molly crowds are interesting because they pose an endlessly fascinating aesthetic challenge, and also because they embody a dynamic and anarchic principle of life to which she is powerfully drawn." Here skaters stream away into the distance; more recognizable close-up, they become abstracted into dark streaks in the snow as they move away and become submerged in Bobak's expressionist brush-strokes. The wide expanse of snow-covered ice is depicted with luscious pastels, and bright sparks of red, green and blue animate the snowy scene. 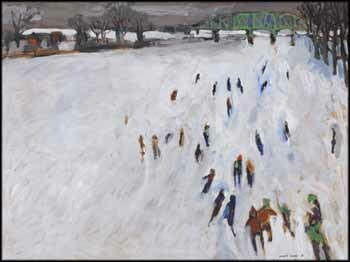 Crowd scenes such as this are the most sought after in Bobak's oeuvre, and Skating by the Green, crackling with the pulse of life, is a fine example.